Seven new ships and three re-branded ships make their debuts in 2007. From the Carnival Freedom’s debut in March to the Queen Victoria’s grand entrance in December, cruisers will have increasingly more choices of where to spend their vacations at sea. Many of the newbies are twin sisters to [% 277935 | | last year’s new ships %], so ground-breaking innovations will probably give way to repeats of the cruise lines’ best onboard amenities. Cruise lines do like a good surprise, though, so perhaps they’ll announce some onboard firsts later in the year. I’d now like to introduce eight cruise lines’ new ships for 2007. You’ll find tips for saving during these inaugural seasons, so you can spend wisely on the newest cruise ships soon to be afloat. Carnival starts off 2007 with the year’s first new ship. The Carnival Freedom makes its debut on March 5 with a nine-night Mediterranean cruise, and then begins its schedule of 12-night Mediterranean cruises from Civitavecchia/Rome on March 14. The ship repositions to Miami in November to sail seven-night eastern and western Caribbean itineraries. The theme of the ship will be a journey through the centuries with each public room featuring a different time period and culture. The Sun King Supper Club remembers the 18th-century glory of Louis XIV, the Studio 70 dance club invokes the disco days of the 1970s, and the Babylon Casino takes its theme from Hammurabi’s palace. Sixty percent of the ship’s 1,487 cabins will offer ocean views or balconies, and wireless Internet access will be available everywhere onboard. Sailings for the Freedom’s inaugural season are already on sale. At press time, the March 14 and 26 and April 7 sailings were a few hundred dollars cheaper than peak-season spring and summer cruises. For more information or to book a cruise, visit Carnival’s website. Celebrity cheats a little this year to make it into the story. The cruise line has announced that two ships will be joining its fleet in 2007, though neither is a new-build. Both ships come from Pullmantur, a cruise line recently purchased by parent company Royal Caribbean. The Blue Dream will become the Celebrity Journey in May and the Blue Moon will become the Celebrity Quest in October. The two ships will receive various Celebrity enhancements during a dry-dock period. The upgrades include 32 new suites per ship, new bedding, and signature elements such as the Martini Bar, Cova Cafe, Sushi Cafe, Michael’s Club jazz/piano bar, casino, AquaSpa by Elemis, and Online@Celebrity. As part of the Celebrity Expeditions line, the Celebrity Journey will sail Bermuda cruises through October, then cruise to exotic locales in South America and Antarctica. The Celebrity Quest will begin with Caribbean cruises to more exclusive islands such as St. Barts, Guadeloupe, and Dominica, then switch to Panama Canal voyages and calls in Central America. For more information or to book a cruise, visit Celebrity’s website. If you want to save on Celebrity Journey voyages, the September and October departures are a few hundred dollars cheaper than the spring and summer sailings. For the Celebrity Quest, its first 12-night sailings in October and November are less pricey than its longer winter cruises. The Costa Serena will set sail from Venice on its inaugural voyage on May 26. From June through November, Costa’s newest ship will cruise out of Venice on seven-night voyages, stopping at Bari, Italy; Katakolon, Greece; Izmir and Istanbul, Turkey; and Dubrovnik, Croatia. The Costa Serena will carry 3,000 passengers at double occupancy. Like Costa’s last new ship, the Costa Concordia, the new ship will feature a Grand Prix race car driving simulator, an enclosable pool deck, and a huge spa with 99 cabins providing direct access to the spa facilities. For more information or to book a cruise, visit Costa’s website. At press time, you could save up to 36 percent off the brochure rates of the Serena’s first sailings in June by booking early. Cunard doesn’t build new ships very often, so it’s always an event when a new one debuts. This December, the Queen Victoria arrives on the scene. Her two maiden voyages in Europe are already sold out. On January 6, 2008, the ship embarks on a 106-night world cruise. The Queen Victoria will display enhancements to the Cunard brand, such as private boxes in the theater, alfresco dining for Grill guests, a museum of Cunard memorabilia, and a two-story library. If you don’t have time to take a close-to-four-month cruise around the world, you can cruise on select segments of the Queen Victoria’s grand journey. Shorter legs include a 17-night sailing from New York to Los Angeles on January 13, 2008, and a 13-night sailing from Singapore to Dubai on March 18, 2008. For more information or to book a cruise, visit Cunard’s website. The MSC Orchestra, another musically named ship in the MSC fleet, will be christened on May 29 in Venice. Eighty percent of the ship’s cabins will have ocean views, with 65 percent of those staterooms sporting balconies. The emphasis will be on airy open spaces and a wide variety of entertainment options. The 2,550-passenger ship will sail seven-night Italy, Greece, Turkey, and Croatia cruises from June through October and an 11-night Mediterranean cruise on November 3. You can save hundreds of dollars with early-booking fares if you reserve your cruise on the MSC Orchestra soon. For more information or to book a cruise, visit MSC Cruises’ website. Norwegian will unveil its next gem of a ship in October 2007. The Norwegian Gem is the line’s fourth Jewel-class ship, along with sisters the Norwegian Jewel, Norwegian Pearl, and the Pride of Hawaii. Like these ships, the Gem will be outfitted with multiple restaurants and lounges, family-friendly accommodations, luxurious Courtyard and Garden Villas, and a bowling alley. After its launch, the ship will homeport in Barcelona and sail a variety of seven- to 12-night cruises. On December 3, the Gem will voyage across the Atlantic to Boston before settling into a series of 10- and 11-night southern Caribbean and seven-night Bahamas and Florida cruises from New York. For more information or to book a cruise, visit Norwegian’s website. The cheapest Gem sailings are its two-night trips out of Barcelona and London. However, you can find the lowest per-night rates on its nine-night transatlantic sailing on December 3, and 10- and 11-night exotic southern Caribbean cruises in January and February. In April, Princess will introduce one new and one new-to-Princess ship. The 3,100-passenger Emerald Princess, the cruise line’s new-build and sister ship to the Crown Princess, will make her debut on April 11. The smaller 710-passenger Royal Princess—formerly Renaissance’s R8 and currently Swan Hellenic’s Minerva II—becomes part of the Princess fleet on April 19. The two ships will meet in Santorini on May 12 for an industry first—a dual christening ceremony. The Emerald Princess will offer the best of the Princess experience with a poolside movie screen, adults-only Sanctuary sun lounge, and piazza-style atrium. The ship will sail Greek Isles and Mediterranean cruises through the summer and Caribbean itineraries in the fall. The Royal Princess will spend time in dry dock to receive Princess’ signature look and feel for before setting off on “Elite Mediterranean” voyages to the Middle East, Corsica, Sardinia, and the Crimean coast, as well as Ravenna, Italy; Split, Croatia; Kotor, Montenegro; and Canakkale/Troy, Turkey. In 2008, the Royal Princess will journey up the Amazon River. For more information or to book a cruise, visit Princess’ website. Most of the Royal Princess’ sailings run about $200 or more per night, making its seven-night cruise on April 19 the best deal going because it’s the shortest. Voyages on the Emerald Princess are vastly more affordable with several itineraries priced under $100 per person per night. By May 2007, Royal Caribbean will boast two ships that share the title of world’s largest. 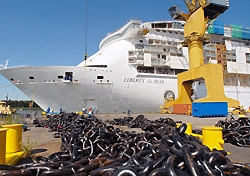 The Liberty of the Seas debuts this spring, to take her place beside her twin sister, the Freedom of the Seas. The two will also share the Miami homeport, both sailing alternating eastern and western Caribbean itineraries. The Liberty will feature the best of the Freedom’s innovations, such as onboard surfing, the H2O Zone aquatic park, cantilevered whirlpools, an ice skating rink, boxing ring, and Presidential Family Suite, which sleeps 14 people. For more information or to book a cruise, visit Royal Caribbean’s website. The cheapest sailings on the Liberty are its September and a few October voyages to either the eastern or western Caribbean. Be sure to check Royal Caribbean’s Hot Deals page for additional savings.